We recently started using a Bunn coffee maker. The design of the unit is really simple, no fancy controls to figure out. No time to keep resetting after the power goes out. No keeping track of how long we have left until it automatically shuts off. Just fill with water, turn on and in about 1 minute, a fresh pot of coffee. It’s the best morning brewer we’ve ever had. 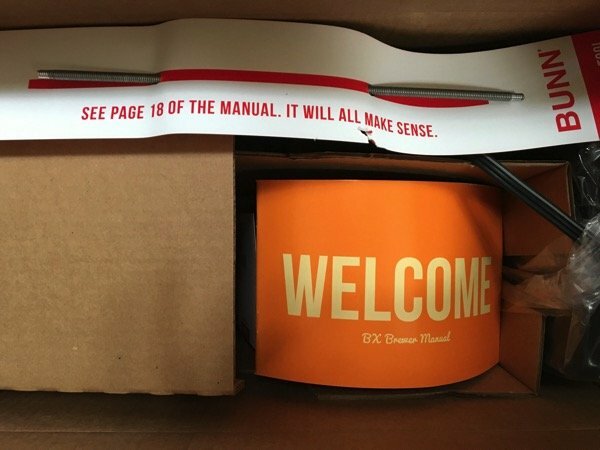 The simplicity of Bunn is immediately apparent when opening the box. This is what we were greeted by when we opened the box. The software we create, regardless of platform, should be this simple. Show me how to get started. No long and boring tutorials here, no complicated user on-boarding. I think we can all learn a bit about user experience here from a brick and mortar business.